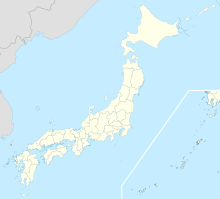 Amakusa Airfield (天草飛行場) is an airport located 2.3 NM (4.3 km; 2.6 mi) northwest of Amakusa, Kumamoto, Japan, on the Amakusa Islands (IATA: AXJ, ICAO: RJDA). Locals often referred to the airfield as Amakusa Airport. It is located on the northern side of the Amakusa Islands, north west of Amakusa city. Only one airline, Amakusa Airlines, uses this airfield, in which the airline is headquartered. On September 6, 1982, the governor of Kumamoto Prefecture announced plans for a small airport during a regular press conference. On December 26, 1990, the Ministry of Land, Infrastructure and Transport approved the construction of the airfield. Construction began in 1992. The first plane that landed at this airport was a DHC-8 of Amakusa Airlines on November 19, 1999. The airfield was opened for public use on March 23, 2000. In the spring of 2000, it had round trips between Amakusa Islands and Kumamoto twice a day. Starting from December 1, 2005, the operating time was extended from (8:00 am ～ 7:00 pm) to (7:40 am ～ 8:30 pm). It now has three round trips between Amakusa Airfield and Fukuoka Airport and one round trip between Amakusa Airfield and Kumamoto Airport (also one round trip between Kumamoto Airport and Kobe Airport) per day while using the same aircraft (aircraft registration number JA81AM). Since this airfield is served only by Amakusa Airlines and this airline only has one aircraft, the DHC-8 (pictured on the right) is the only regular, scheduled, aircraft that uses this airfield. Landings are made using VOR/DME approach on runway 13/31. The airport has a single runway, 13/31, which is 1,000 m × 30 m (3,281 ft × 98 ft) and is constructed of asphalt concrete. The lighting systems on runway 13/31 are High Intensity Runway Lights, Runway End Identification Lights, and Precision Approach Path Indicator (PAPI). All ground transport is located on the first floor. Kyushu Sanko Bus (九州産交バス) operate bus routes from airport to Amakusa city. The airport is connected by Kumamoto Prefecture Amakusa Highway No.334 and Itsuwa Road No.47. ^ "Amakusa Tanegashima Airport Statistics" (PDF) (Press release). Osaka Ministry of Land, Infrastructure and Transport Civil Aviation Bureau. Retrieved 8 July 2016. ^ "Poised for certification" (PDF). Bombardier. September 1999. ^ "Timetable of Amakusa Airlines" (in Japanese). Archived from the original on 2009-05-29. Retrieved 2009-07-18. ^ "Statistics of airports in Osaka region in 2008" (PDF) (in Japanese). Osaka Regional Civil Aviation Bureau. ^ "Statistics of airlines in western Japan in 2008" (PDF) (in Japanese). Osaka Regional Civil Aviation Bureau. ^ "大阪航空局_大阪航空局のご案内_統計情報_利用実績速報 (Statistics of airports within Osaka Region)" (in Japanese). Osaka Regional Civil Aviation Bureau. ^ 天草飛行場 (in Japanese). (Japan) Aerodrome　Support　and　Aeronautical　Service. Archived from the original on 2009-07-09.